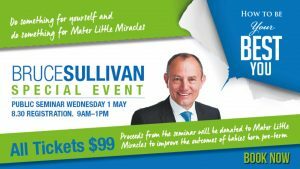 LGMA has invited Bruce to present at numerous events for our members over the last five years. Local government has experienced much turmoil during this time and each time Bruce has this audience, he leaves them with a renewed vitality to return to their home and workplace and make their environment a happier, more productive place. All of Bruce’s messages are logical but delivered in an entertaining, thoughtful and non-threatening presentation which allows the audience to absorb all of the points raised and develop ways to implement in their own lives. He is a strong, confident speaker who is professional and personable. Our delegates have always rated his presentations highly through evaluation and we will certainly be inviting him back in the future. I would have no hesitation in recommending Bruce Sullivan as a keynote speaker.